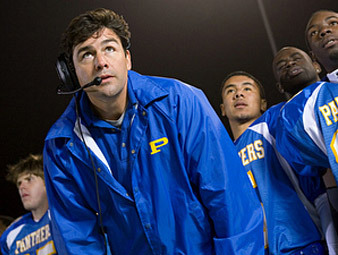 “Friday Night Lights” returns Friday at 9/8c on NBC, but Coach Eric Taylor won’t be on the field for the Dillon Panthers. Anyway. “FNL” is only a TV show. It just happens to be a great one that doesn’t feel like conventional network TV. But it’s still a TV show. Caution: Spoilers for season ONE, if you haven’t seen it, follow. Only minor spoilers for Friday’s season two premiere. What might make Friday’s episode a particularly tough entry point for newcomers is that a lot happened at the end of season one (or offscreen between seasons) — namely Coach Taylor taking the job at UT and leaving Dillon for Austin — and Friday’s episode tries to deal with that. It does so up to the usual “FNL” quality standards. The arc involving the Taylor family is involving and makes you genuinely wonder how the top-billed character is going to remain as a focal point on the series now that he no longer lives in Dillon. In Friday’s episode he arrives in time for the birth of the new Taylor baby. His separation from his family has taken its toll. And there’s some solid father/daughter stuff here when Julie begins questioning her relationship with Matt and goes into a bar to watch a guy in a band that she has a crush on. The way these scenes unfold are typical of what “FNL” does well regarding teenage angst and family bonds. But Friday’s episode also has things that don’t work. Mainly the lame material involving Tyra being stalked. And then there’s the Big Plot Development, which for my money represents a minefield for future episodes of this series. In short, something happens in this episode that feels — just feels — “written for television.” It does not fit with the tone of this show, nor do I believe the characters would react the way they react. It is a contrived plot development that rings false. How the writers deal with this will be of huge importance, but what troubles me about this development is that it seems to go against what this show is about. It is scripted and extreme and is the stuff of “plots” rather than “stories.” It goes against what makes “FNL” great. For many other shows, this would be a perfectly acceptable story. For “FNL” it edges dangerously close to “jumped the shark” material. And I hate the very notion that I have to even consider using that term for this series, particularly in the first episode of season two. But I don’t want to be an alarmist. “FNL” is still solid and engaging, and there’s plenty of other good stuff going on. I’d like to maintain faith that the writers can keep this show going as one of TV’s best. But they are going to have to tread carefully on how they deal with one major arc that comes out of the season premiere. Hello…I Googled for faith, but found your page about …and have to say thanks. nice read. I rented the season 1 DVDs based on your recommendation and LOVE the show. I’m now caught up with season 2 via nbc.com, and I’d say this season has been a little too plot-driven, rather than based on the great characters. Landry being on the team doesn’t help much either, I liked his POV as an outsider last season much more. Not to mention that…other…thing that Landry did, I think that was a bit much. We’ll see what happens, at least until they run out of scripts courtesy of the strike.